5 Beds 3 Baths 1 Partial Bath 3,377 Sq. 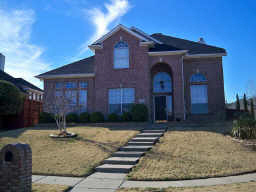 ft.
Gorgeous 5 bedroom house in Chase Oaks with about $50,000 in recent updates. Beautiful landscaping, Elegant entryway, Formal dining & breakfast, open kitchen, granite countertops, stainless steel appliances, gas cooktop, Travertine tile, wood floors, large bedrooms, walk in closets, huge gameroom, and high ceilings. Roof replaced Oct 2009. Excludes: master bedroom curtains.